For more than 150 years, TAG Heuer has been committed to one major goal and mission: providing consumers with the most precise mechanical timepieces possible. 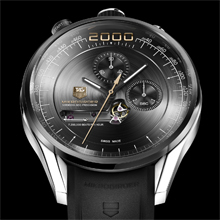 In the world of Swiss watchmaking, accuracy is certified by the Contrôle Officiel Suisse des Chronomètres (COSC). 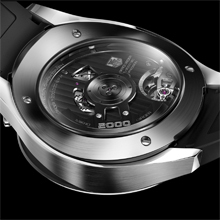 The resulting certification, however, only covers watch functionality (HMS – Hours-Minutes-Seconds), not chronograph functionality. To ensure ultimate chronograph quality and precision, TAG Heuer is developing a reference protocol that will soon establish the highest possible quality standard. In order to succeed, TAG Heuer needs access to the most accurate timepieces for measurement — at least 10 times more precise than any chronograph currently sold to consumers. This is one of the key reasons why, in the 21st century, TAG Heuer’s R&D has been so single-mindedly focused on pushing further and higher the limits of high frequencies… from 4 Hz to 1,000 HZ in just 7 years! The regulation of a conventional mechanical watch is performed by a balance wheel and a spiral-shaped torsion hairspring, a system invented by Christiaan Huygens in 1675. Over the centuries, every aspect of this regulating system has been modified, improved, optimized and enhanced, yet as each new improvement remains based on Huygens’ original concept, it remains a compromise, never an ideal. The Huygens system, although very reliable and aesthetic, has its limits: accuracy, sensitivity to gravity and thermal expansion, and the virtual impossibility of ever reaching a frequency higher than 500 Hz. To solve these ‘limits’ and take Swiss watchmaking to a new unsurpassed level of excellence, TAG Heuer’s award-winning team of engineers and watch masters made a radical decision: to forget the hairspring and the balance wheel and, starting from a blank page using mechanistic theory, entirely reinvent mechanical watch regulation — just as Christian Huygens did so successfully more than 3 centuries before. Conceived, developed and manufactured in-house in the company’s R&D lab in La Chaux-de-Fonds, Switzerland, the MIKROGIRDER is the fastest mechanical regulator ever crafted and tested. Overturning three centuries of watchmaking convention in the way mechanical energy is generated, stored and regulated, the MIKROGIRDER opens a promising new era in watchmaking, with potentially powerful and energy-sparing new movements precise to ever-smaller fractions of time. The MIKROGIRDER’s dual frequency system ensures precision and chronometry through 2 independent chains. As there is no possibility of interference between “normal speed” and “high speed”, there is better precision and accuracy. The power reserve is improved, too, and wear and tear dramatically reduced, as “high speed” is “on demand” instead of being always engaged. Finally, the dual frequency system offers the ultimate in readability. The smallest fraction of time — 1/100th, 1/1,000th and ½,000th (5/10,000) of a second — is displayed on a central hand that does a complete revolution around the dial a mind-boggling 20 times per second. Furthermore, and like the Mikrotimer Flying 1000, the dial display allows a quick and easy reading of the incredible measurement thanks to 3 scales, 2 external and one at 6 o’clock allowing to read 5/10,000 or 1/2,000ths of a second. A breakthrough providing an astonishing new level of high-frequency performance — without sacrificing precision or efficiency — the TAG HEUER MIKROGIRDER represents in and of itself an enormous technological leap forward. The potential benefits to future chronograph design and function might be huge, and TAG Heuer, once again, leads the way. True to its “Technology and Design” DNA, TAG Heuer has embedded this mechanical engineering masterpiece in a new stunning asymmetric chronograph case design. Though the placement of the crown at 12 o’clock is inspired by the 1/100th of a second Heuer stopwatches of the 1920s, the overall design is decisively avant-garde. The unconventional shape and wide opening makes for easier reading, while the dial design allows one to see the blade/girder regulator system “at work”. 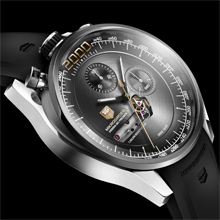 A new Concept masterpiece from TAG Heuer, it could very well become a commercial piece like most of its Concept predecessors of the last 10 years, including the Monaco V4, the Calibre 360, the Monaco 24, the Mikrograph 100, and, since the end of 2011, the Mikrotimer Flying 1000.